I can post again, YIPPEE! 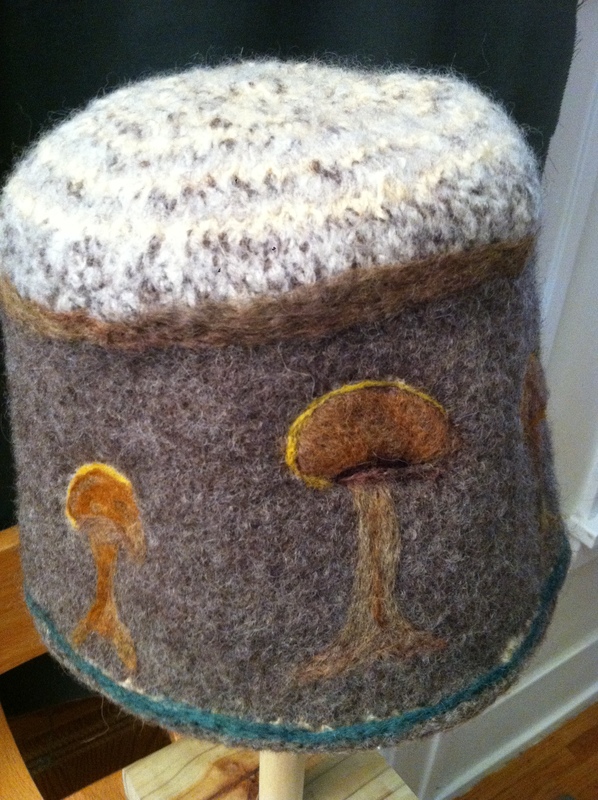 Have a look at 4 recent posts – check out Coffee Cozies, Sculpted Hats, Spring Buds and best of all Mushrooms Of The Forest. 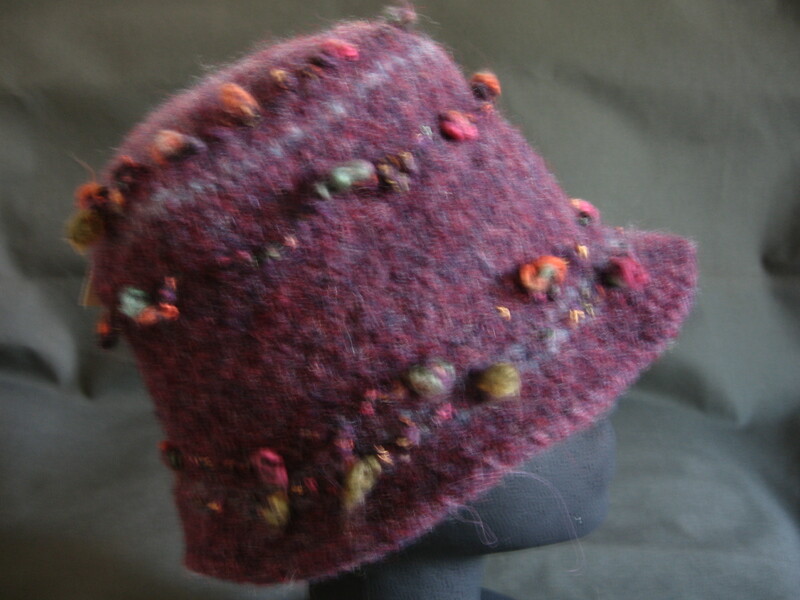 Dry needle felting embellishes a hat beautifully. Here Spring Buds make a garden in the round! 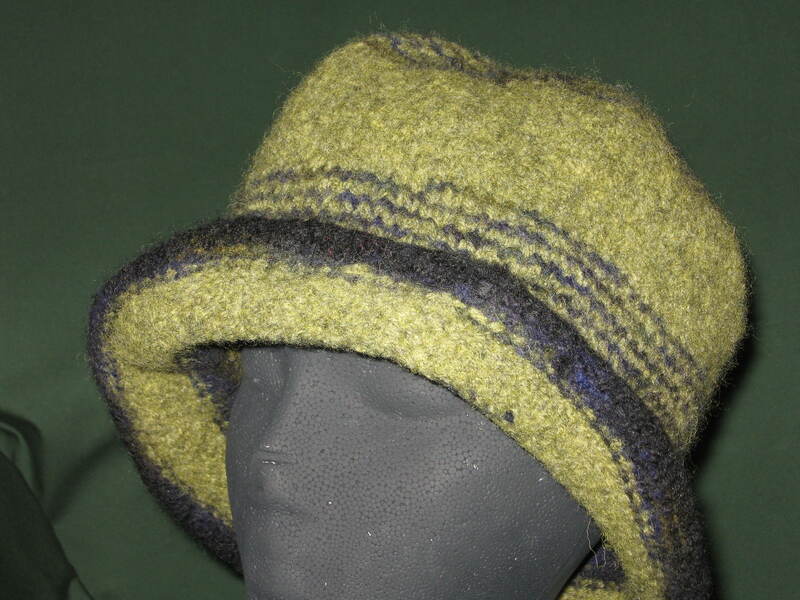 A wet felted hat can be sculpted – making ridges/pleats and a versatile look and a hat that squishes short or stretches tall as desired. .
Mushroom of the forest – you can wear them, squishy soft, eye-catching, stylish and warm! 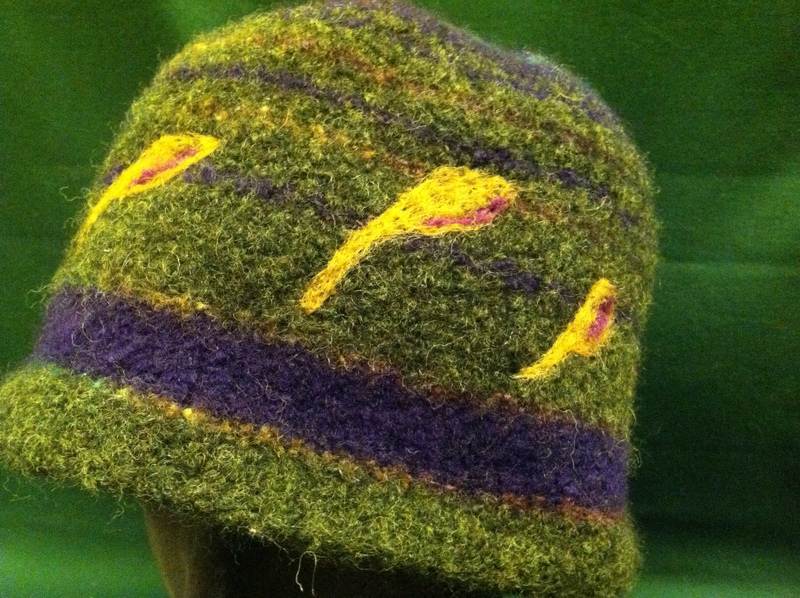 Alpaca (100%) makes an extra soft hat with a Knobby texture!!!! 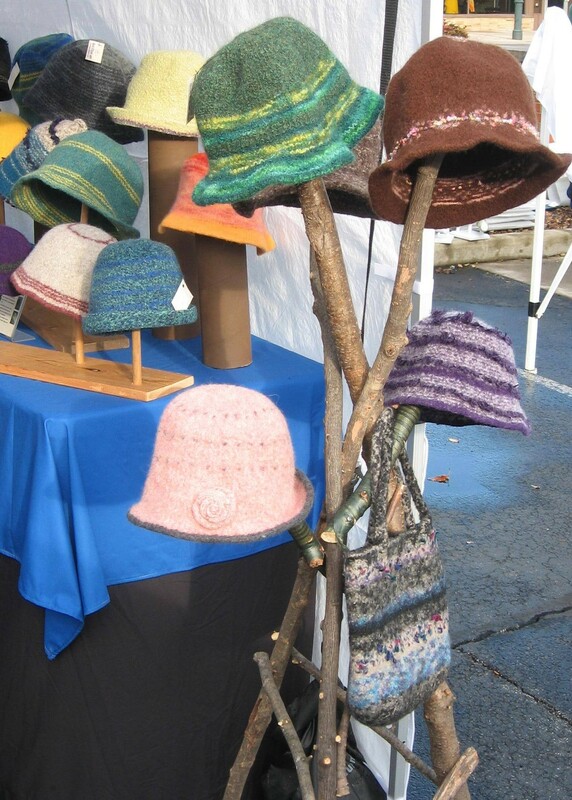 Another great Black Swamp Arts Fest – Thick 6 foot branches formed 2-Hat Trees at the entrance of Got Fiber Art (Hat Shop) booth this year. 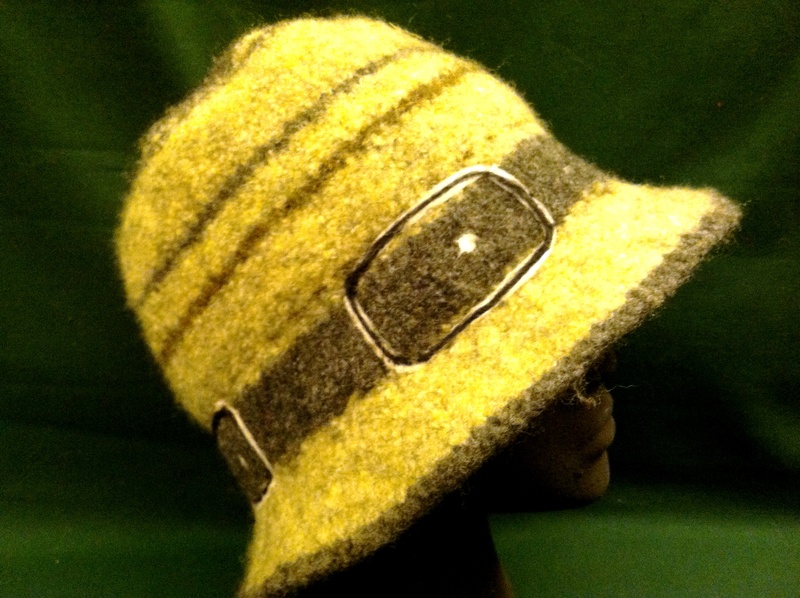 Visitors strolled through all weekend for a look, to try on and to select a new hat. A number of repeat customers returned. Each had a story to tell about last year’s hat, where it was worn and by whom. This year they wanted a new look – a different color, size or style. The entire festival brings 50,000 people to our small college town of Bowling Green, Ohio. Visitors had to set a fast pace – there were more than 150 art booths, more than a dozen food vendors, 3 stages of music, an enormous kid area with their own stage and a whole lot of people watching to do through out 4 blocks of our town center. 50 volunteers work all year planning the fest and 700 volunteers manage the weekend. This year was the 20th year for the Black Swamp Arts Festival and that’s just about a generation of celebration and fun. Join the 21st BSAF in 2013 the weekend after Labor day!!!!!! I am here. 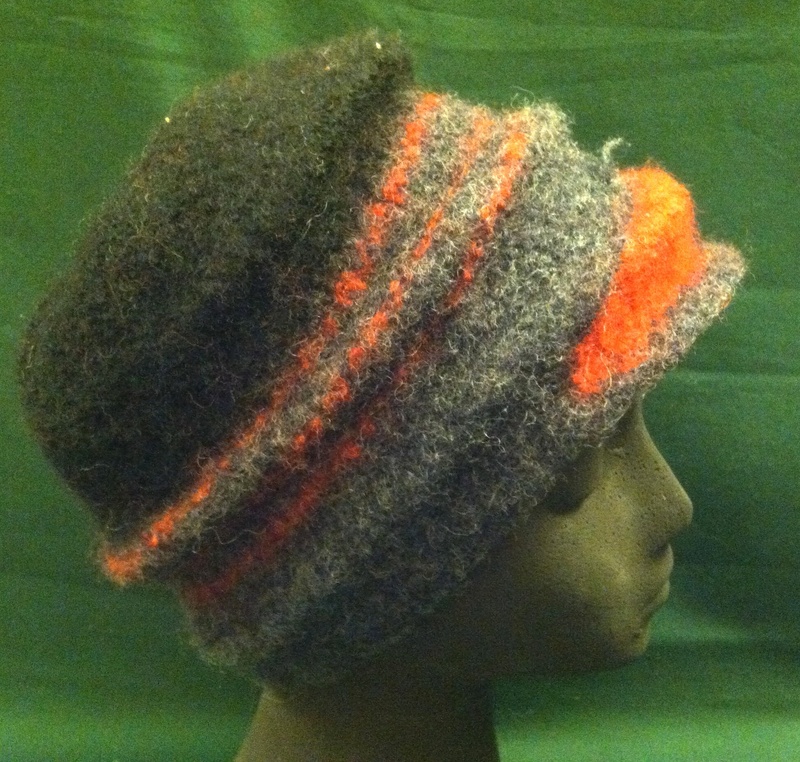 Felting not so much in warmer weather but here are a few new hats in new yarn! I like the bold stripe on the brim. Greens are wonderful, there are so many of them. 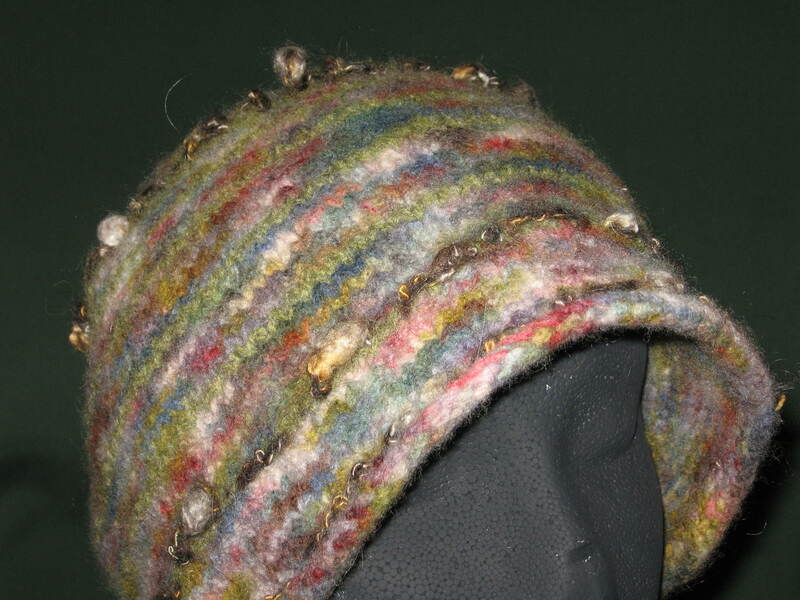 texture in this hat brighten the other colors making paths of color like blossoms in Spring.